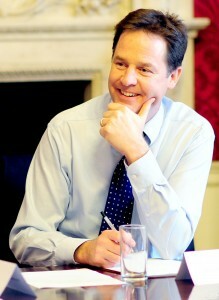 As Deputy Prime Minister, Sir Nick occupied the second highest office in the country at a time when the United Kingdom was recovering from a deep recession following the banking crisis of 2008, and hugely controversial decisions were needed to restore stability to the public finances. During that time, he oversaw referenda on electoral reform and Scottish independence, and extensive reforms to the education, health and pensions systems. He was particularly associated with landmark changes to the funding of schools, early years’ education and the treatment of mental health within the NHS. His book, ‘Politics: Between the Extremes’, is a reflection on his time in Government and the place of liberalism in the current political landscape. Sir Nick is one of the most high-profile pro-European voices in British politics, and has played an influential role in the debate leading up to and since the EU referendum in June 2016. His insight into the most senior levels of UK government, combined with an integral understanding and experience of European politics, contacts at the highest levels of government across the EU, and fluency in five European languages, mean that his views and analysis on the current Government’s Brexit negotiations continue to be in high demand. He published his second best-selling book – ‘How to Stop Brexit – and Make Britain Great Again’ – in October 2017. As well as leading his small think tank, Open Reason, Nick is a Global Commissioner for the Global Commission on Drug Policy, and a trustee of the Social Mobility Foundation and Radix, a radical centrist think tank. He remains an outspoken advocate of civil liberties and centre ground politics, of radical measures to boost social mobility, and of an internationalist approach to world affairs. He received a knighthood in the 2018 New Years Honours list, for his political and public service.